I’m the default prey of mosquitoes—this I realized as we were growing up. I’d end up the one with the most bites, and there seemed to be no escaping it. My mother complains that she goes through the same thing. Which has made me wonder if mosquitoes bite preferentially. (This break has given me time to wonder about a lot of things!) I read somewhere, in a kids’ magazine that likely didn’t do aggressive fact-checking, that mosquitoes bite people who wear blue (I have a couple of blue shirts—too bad) and that they like children who haven’t showered (I took showering seriously when I was young—ok, not so seriously during summers when I didn’t have 7 am classes to catch!). A study published in Current Biology, “Modulation of Host Leaning in Aedes aegypti Mosquitoes,” now shows evidence that mosquitoes don’t choose randomly. They, in fact, prefer some individuals in a host population over the others. The group of Dr. Clément Vinaguer showed that mosquitoes learn the scents of specific humans and odorants. They also avoid the scent of rats but not chickens. Their experiments showed that mosquitoes perform “aversive learning.” They are able to associate the mechanical disturbance with the scent of the person who does the swatting and therefore avoid such a person. 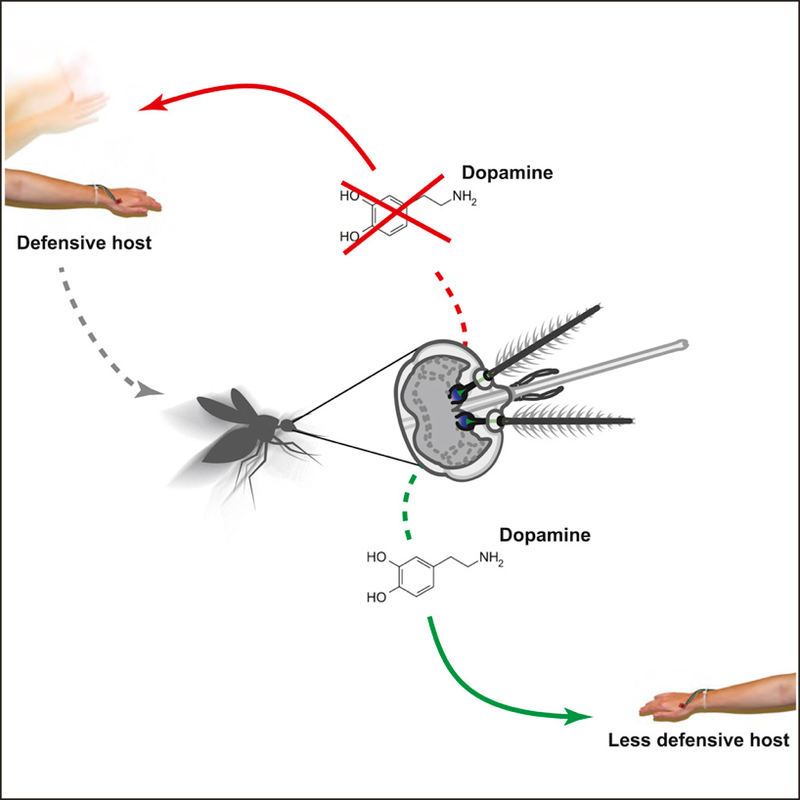 By editing their genes, these scientists demonstrated that the gene that codes for a dopamine-1 receptor, suppressed this learning and therefore distorts the mosquitoes’ preferences. (See the illustration above). The message is clear: keep swatting the mosquitoes away. If you don’t kill them, at least they’ll know you plan to do them harm and will find someone else to bug. How interesting! Who mosquitoes prefer depends on whom I'm with. Discovery Channel was where I heard that they like the color blue.